Der Artikel Yolanda Kondonassis - Wedding Music wurde in den Warenkorb gelegt. Hochzeitslieder - wer kennt nicht das Problem, die richtige Musik für diesen besonderen Tag zu finden. Yolanda Kondonassis hilft. Auf ihrer Harfe spielt die Komponistin, welche hervorragend zu einer Hochzeitszeremonie passen. 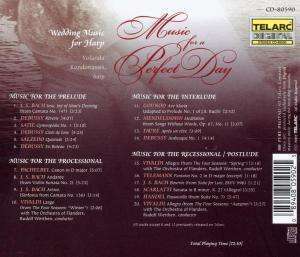 Darunter befinden sich Werke von Bach, Debussy, Satie, Vivaldi u. a.
Telarc presents the year's most beautiful wedding collection, Music for a Perfect Day, offers classical pieces specially selected for the contemporary wedding ceremony. More and more brides are choosing to have harpists perform for their wedding ceremonies. 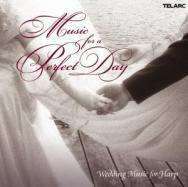 This beautiful collection of classical pieces for harp features selections that are not included on any other wedding album, uniquely suited to all parts of the wedding service, and performed by Yolanda Kondonassis, one of today's most acclaimed harpists. The booklet notes contain helpful suggestions for the bride-to-be in planning music for the wedding, including a description of each of the essential musical parts of the wedding ceremony: The Prelude, The Processional, The Interlude, The Recessional, and The Postlude. Hörprobe Track 1: 10. Choral: "Jesus bleibet meine Freude"